The parallels are often stunning. 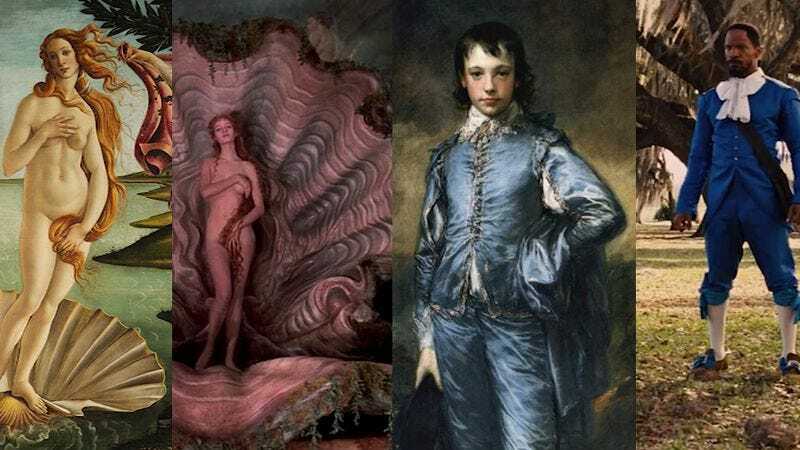 Most fans of Terry Gilliam probably know that his film The Adventures Of Baron Munchausen deliberately cites Sandro Botticelli’s The Birth Of Venus. But did Quentin Tarantino fans catch the nod to Thomas Gainsborough’s Blue Boy in Django Unchained? Like his mentor Robert Altman before him, Paul Thomas Anderson decided to work a parody of The Last Supper into a film, recreating the famed Leonardo Da Vinci mural in Inherent Vice. Screenwriter Joseph Stefano has cited the work of Edward Hopper as an influence on Psycho, and indeed Norman Bates’ spooky dwelling in the film is a dead ringer for Hopper’s House By The Railroad from 1925. At only two and a half minutes, Film Meets Art only scratches the surface of an extremely intriguing topic. Efendi says that a sequel is possible, however.